As the only development on Taylorsville Lake, Edgewater Resort is the ideal place for families and couples wanting to make the most of their treasured vacation time by blending recreation with relaxation. Relax poolside at our Kentucky resort's outdoor swimming pool. Whether you are looking to get some summer sun or wanting to make a big splash, the swimming pool is the perfect place to enjoy the warm weather, mingle with friends, and make the most of your Kentucky vacation. With Taylorsville Lake access and a marina right in our backyard, there's plenty to do! Bring your kayak, canoe, paddle board, pontoon, fishing boat — or rent one for a very reasonable rate from Taylorsville Lake Marina. Get out on the water and enjoy the beautiful Kentucky scenery! Edgewater Resort has a few short hiking trails that can easily be enjoyed. They are perfect for a simple walk in the woods, or you can enjoy exploring along the stream which leads to a cove of the lake. Enjoy sunset from the swing on the point overlooking the lake. What better way to end a day on the lake or at the pool then roasting marshmallows over an open fire under a star lit sky in one of Edgewater Resort's in-ground fire pits? The fire pits are located near the playground, by cottages 51/59, and back by the pool. Availability is subject to weather conditions. Let your kids burn off some energy at our resort's playground. Use this time to relax or multi-task and get dinner ready — there are picnic tables and a charcoal grill just a few feet away. 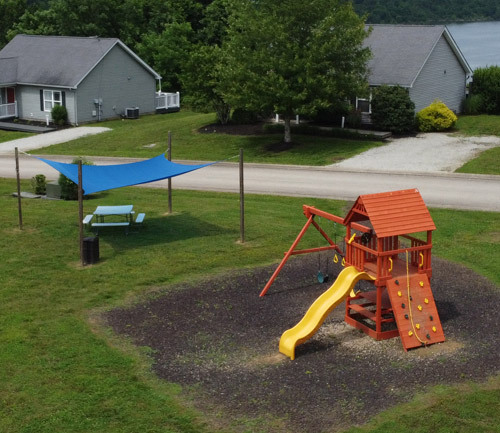 The playground and volleyball court is conveniently located in the center of our Kentucky resort. Get directions to our Kentucky resort. 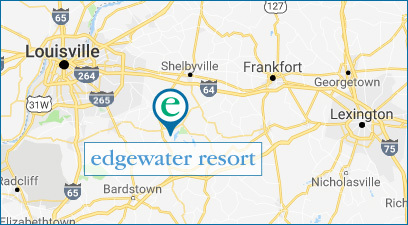 Copyright © 2018 Edgewater Resort in Kentucky | Cottages at Taylorsville Lake, LLC • Website design and hosting by First Net Impressions, LLC.